One of my favorite things about blogging is getting invited to various events that I personally would love to be a part of have I not become a blogger. 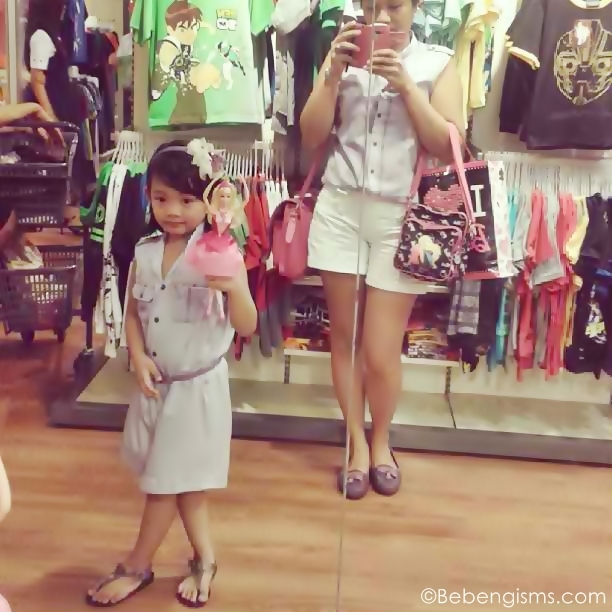 My little ballerina and I, in matching clothes we got from Au Pair Addizione, marched to SM City North EDSA to attend the exclusive movie screening event of Barbie™ in the Pink Shoes. 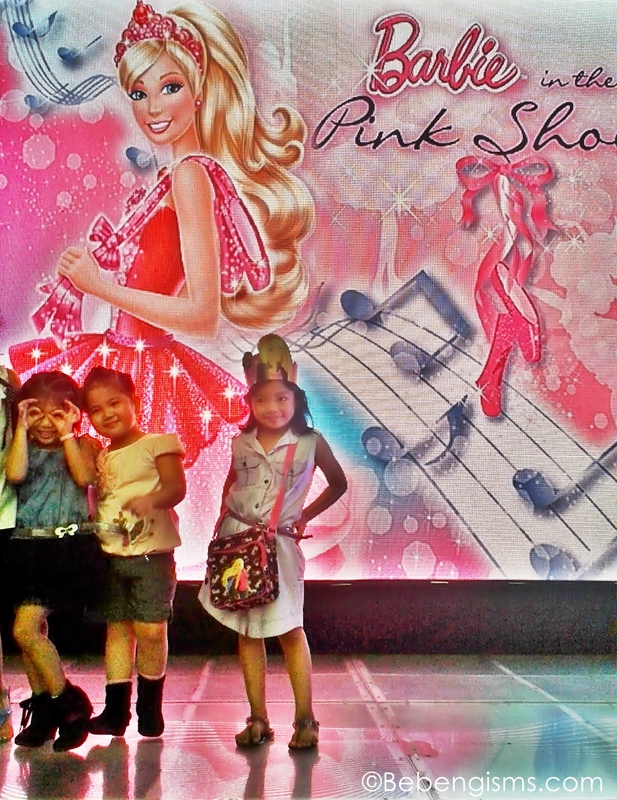 Sophia was already too amazed that we were wearing matchy-matchy that she felt so donya-ish she made that pose, haha. I let her with that stance since I made a mental note that it has to be HER day - yes, all about her. It's been such a long time since I dated her out. May 5, Sunday was the perfect day to just do that. Boy, was she googly eyes the whole time! We casually walked from SM North EDSA main mall to Skydome Sky Garden, armed with so much excitement, enjoying all the material happiness that we've seen. She was in disbelief that she was actually in a mall! Hehe. Sorry mothers, we don't go out that often anymore unless the father, who drives, is with us. 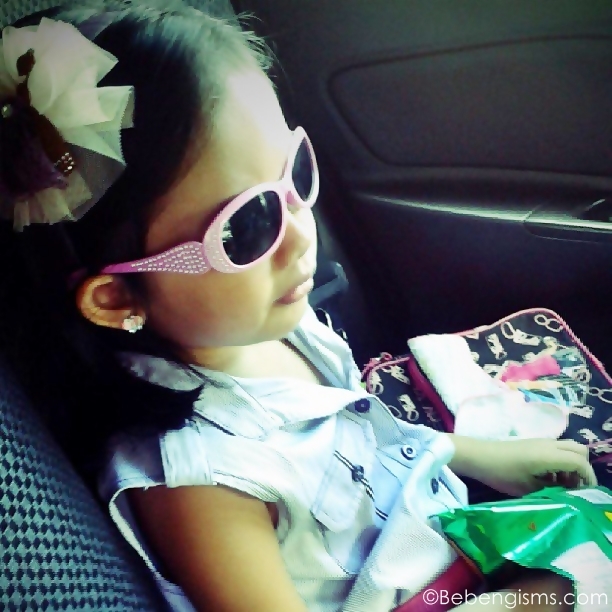 Taxi fare is just so impractical and unfair plus commuting is always a struggle with a kid in tow. Pollution and traffic, both crazy. Anyway, I let her have fun. And did a photo op with SpongeBob and Patrick - the duo that can really make her laugh, aside from me and R.
I'm not really a smart citizen of this country that I thought Skydome was a cinema house, an actual sinehan. You know, all the paandars - lights off, freezing airconditioner and popcorn. 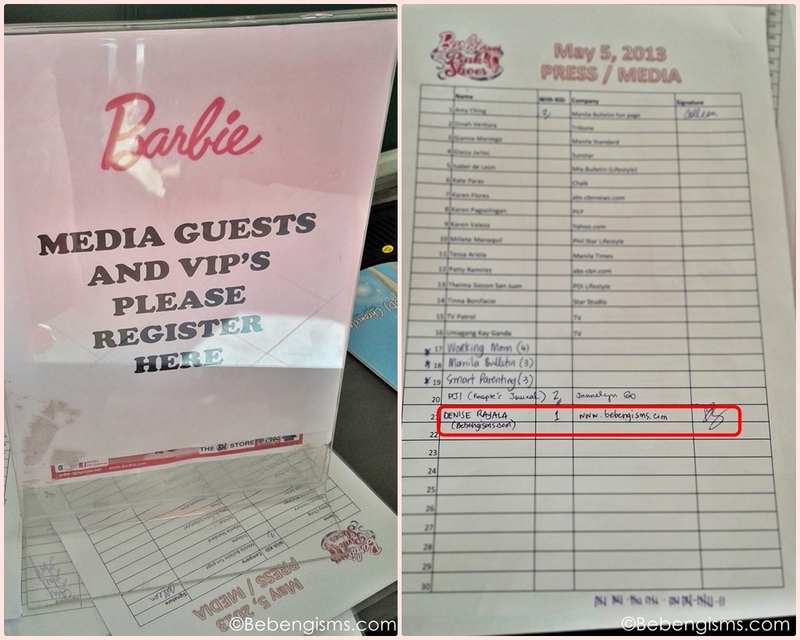 It's a separate venue meant for events pala. So technically, Sophia has not stepped her malapad feet yet inside a sinehan to watch a movie (she did na for PSS graduation, though). That, R and I have planned to make it happen for Monsters University on June. Anyway, we were about to line up (which was long ha) when I remembered I was advised by my contact in ABS-CBN Publishing, Inc. that I have to look for a certain person from Rich Prime to get access. Uy, I'm not going to be a hypocrite ha, but I loved the feeling and sound of being a VIP or part of media. I'm sure bet din ng donya kong date yun. Chos. When we got inside, the venue was divided into two segments. 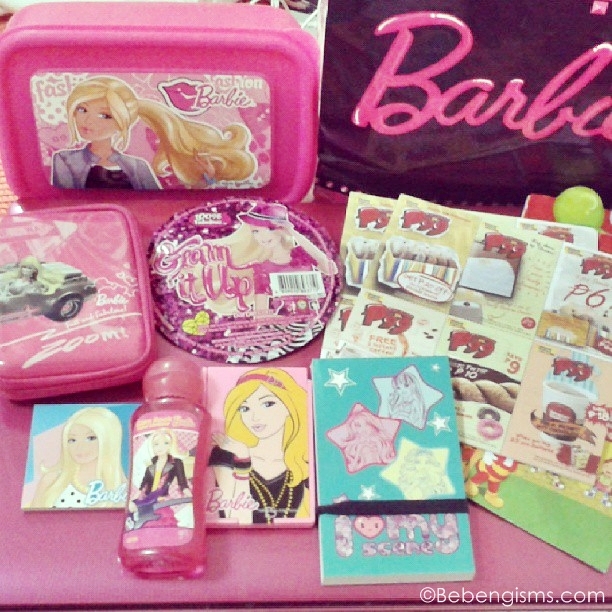 The right part was filled with Barbie merchandise. There was a make-over area, which my girl didn't get to experience because her alalay (me!) was lazy to wait for her turn. The photobooth had a shorter line but she was fixed to have a Kristin Faraday Barbie doll so I didn't insist to have our photo done. Sayang lang, I didn't know we were prioritized pa naman daw sana. Anyway, we haven't had a serious meal for lunch so my tummy was rumbling na, good thing they gave us Red Ribbon mamon (hehe), along with a paper bag of Barbie goodies. 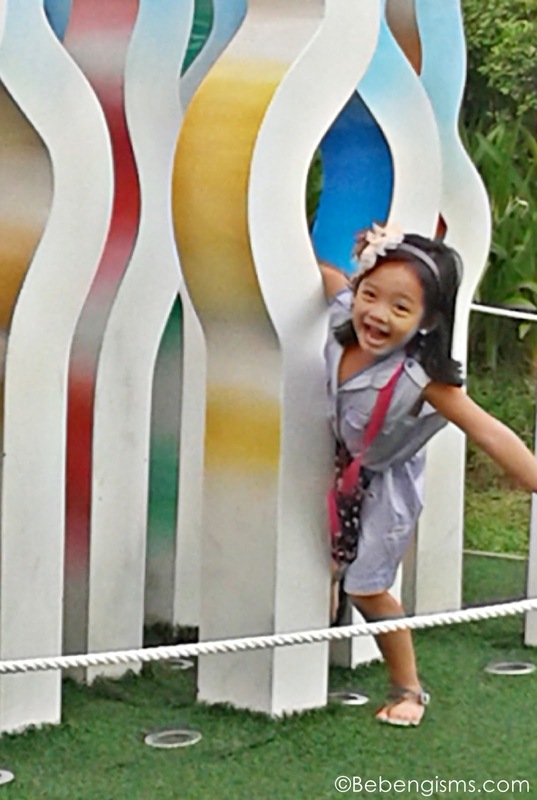 I was as happy as my kikay girl. Who doesn't love freebies, right? The event started a little after 2pm, but just right to give time for attendees to have their photos taken at the stage, for posterity. I had a funny mommy moment because my tiny effervescent photobomber kept on including herself in other girls' photo frames. LOL. She was trying to make friends, but some girls were maybe a bit shy, so she didn't gain one. Aww, my poor little party girl. 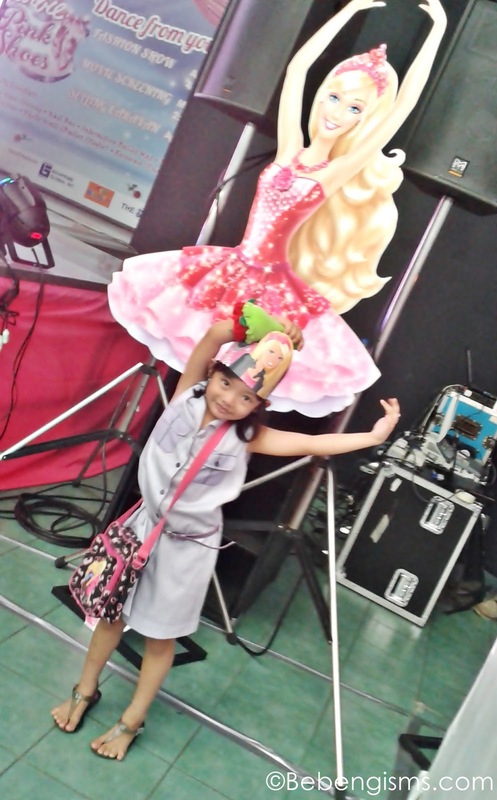 She lovingly posed a la ballerina beside the Kristin Faraday™ standee. 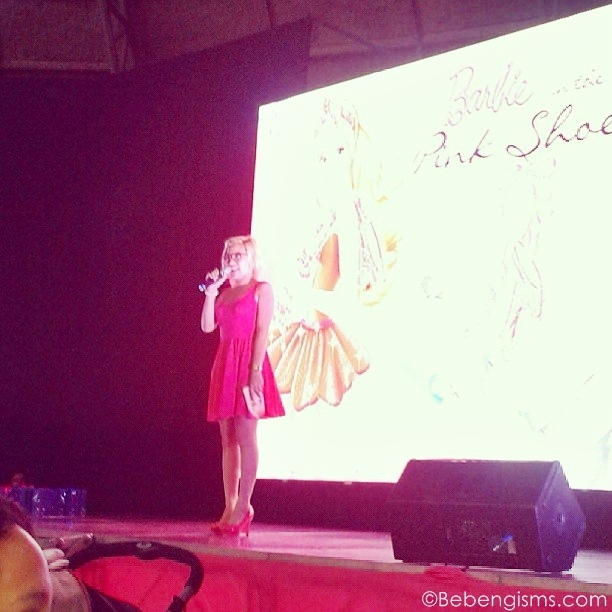 Then the event host, Joyce Pring, wearing a bright pink dress and faux blonde hair officially opened the what-seemed-to-be an alienating experience for my li'l shocked suburban baby. She conducted a bring-me game that we lost, of course, much to my girl's dismay. She also drew names for the raffle, which we weren't a part of because it was just for those who had the pink pass (given to those who bought at least Php1000-worth of Barbie merchandise on a single receipt). The movie finally started, and as a VIP or part of the "press", we were seated in front. It was near the stage and my ears were ringing at the loud sound coming from the speakers. 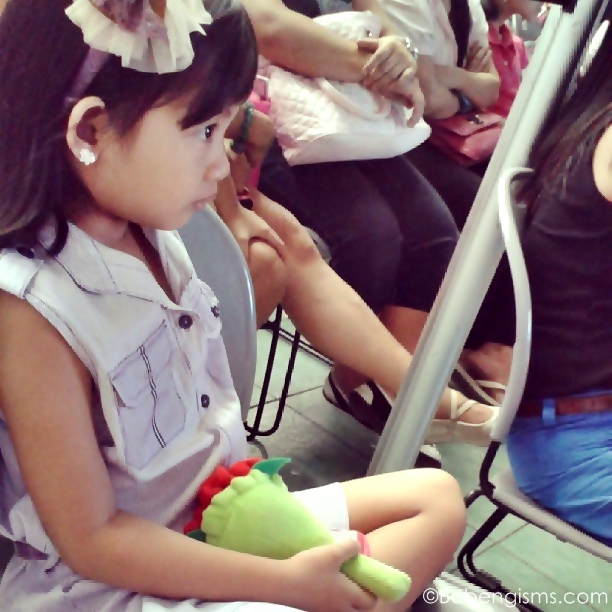 Sophia did not complain at all, she was glued to the dancing doll and could not be moved. After the movie, I wanted her to try the make-over, wishing there were no girls being attended anymore. But I was wrong, the line was longer! And so was the photobooth's. Ending? 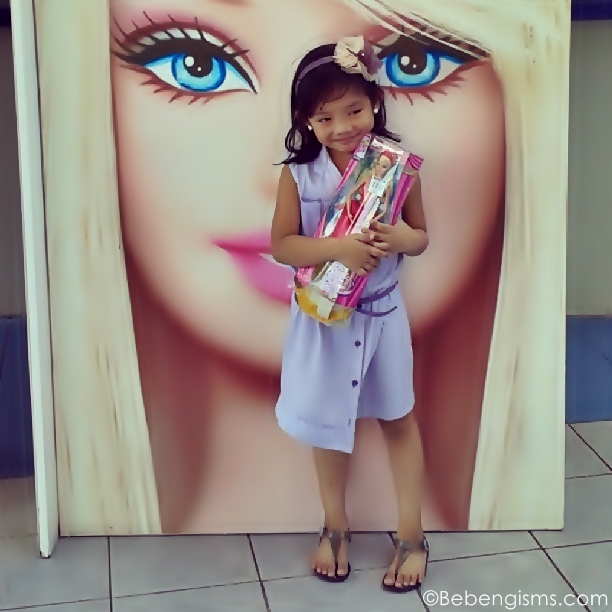 I impulsively bought a Kristin Faraday™ Barbie doll after a cute prodding from my my unica hija. She was in heaven. 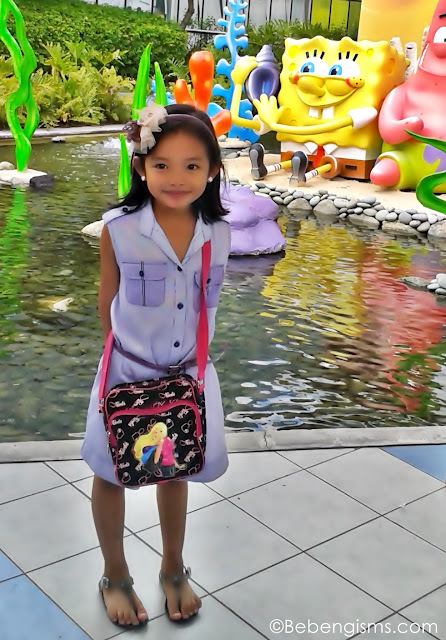 I may have spent Php889.77 (originally, Php999.75, less 10% because I'm a SMAC holder) out of budget but I know the happiness I gave my daughter was more than the price. Galing naman! my girl loves this movie.great mom-daughter date!